The Clockworks: Damien Greaney, Tom Freeman, James McGregor, and Seán Connelly. SOMETIMES THE hype is justified. When The Last Mixed Tape call The Clockworks “a band definitely on the verge of breaking through”, Outcast magazine declared them ”Ireland's next big thing”; and U&I described them as the kind of group “the Irish music scene has been overdue for some time”, it was not talk. It is fact. If you remain to be convinced, or are willing to see why The Clockworks - James McGregor (guitar/vocals ), Seán Connelly (lead guitar/backing vocals ), Tom Freeman (bass ), Damien Greaney (drums ) - are eliciting such praise, see them play the Róísín Dubh this Saturday at 9pm. The last 12 months have been an exciting period for The Clockworks. 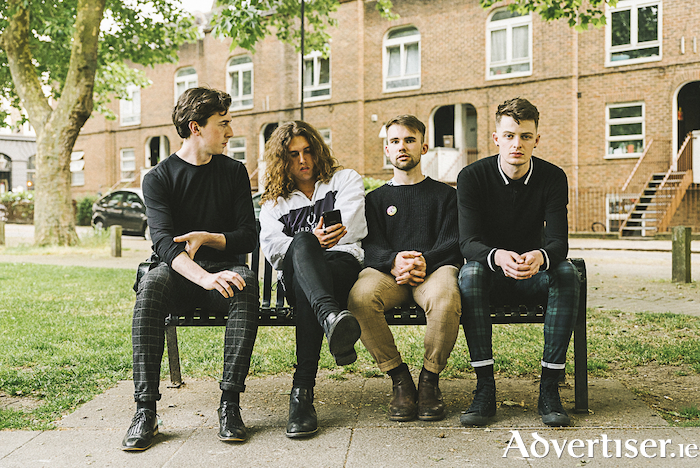 In November 2017, there were selected as one of only a couple of Irish bands to play at Canada's prestigious Indie Week festival in Toronto; released the single ‘Rumours In The Stockroom’ in February, playing shows in London and Brighton, before August saw the release of their debut EP, At The Greasy Spoon, followed by an appearance at Electric Picnic last month. At The Greasy Spoon is a powerful showcase for both The Clockworks' signature sound - taut rhythms, sharp metronomic riffs, and stripped back, gritty atmospherics, and a knack for an anthemic hook - and their point of view. In four songs they tackle addiction, debt, apathy, and helplessness, unflinching depictions of individuals - and a generation - out of their depth and struggling. As James sings on 'The World Owes Me A Favour': "I'll die in over-draft. I'll die in the underclass." The EP was met with positive reviews. “Few can deliver the banality of everyday life in such a lively upbeat musical manner than these boys" declared RemyMusicIRL; Pure M gave it five stars and called The Clockworks “Ireland’s hottest Indie punk band”; while the Galway Advertiser said it “confirms the talent, ambition, and intelligence that has made The Clockworks such an exciting prospect”. “For the first time, a lot of the reception we got was what we hoped we would get,” says James. “When we were putting those songs together, we had certain genres in mind and the songs had certain things for us, so it was great to see that reflected in the views. They got what we were doing. We felt such-and-such a song was more post-punk, and the reviews said it was post-punk. Music is very subjective, and that’s good, but it’s nice when you’re trying to make a point, and people get it. The reviews are re-affirming. It does motivate." And The Clockworks are a band who have a point to make. They are one of the few in the indie-rock/alternative genre - or, more accurately, one of the few all-male bands (female led, or all-female bands have been examining such issues for a while now ) - willing to grapple with the impact of politics, economics, and societal expectations on life, and how they can hinder and beat down individuals, rather than advance them. “We want each of our songs to be a reflection of what we were feeling at the time,” says James. “Some albums are full of political songs. Some are full of love songs, but generally people are a mix. Some days you are ‘I can’t believe such-and-such a politician has done this’, and the next day you’re in a fight with your girlfriend, so for me, if I feel something, an emotion I think is worth writing about, I will write about it. ‘The personal is political’ is an apt description for the kinds of issues The Clockworks deal with, and unusually, they are willing, as men, to critically interrogate masculinity, as on the singles ‘Rumours In The Stockroom’, ‘Mazda’, and ‘Girls Like You’. The band’s sense of ambition is not just in terms of reaching audiences, or playing ever bigger venues and festival stages, it is also musical. While The Clash and The Libertines remain touchstones, The Clockworks have, of late, been expanding their influences.